1. Begin by roasted the butternut squash. 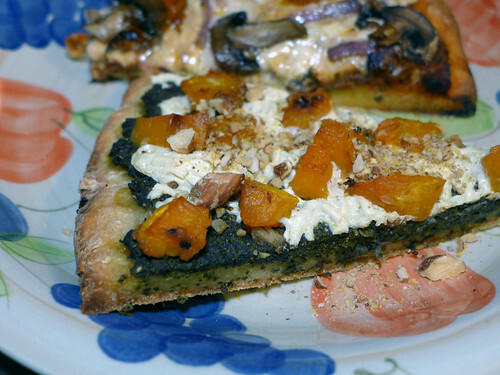 In a 9″x12″ glass baking pan, combine the squash, olive oil, garlic, and salt; mix well. Bake uncovered at 425F for 30 to 45 minutes, stirring once or twice throughout. 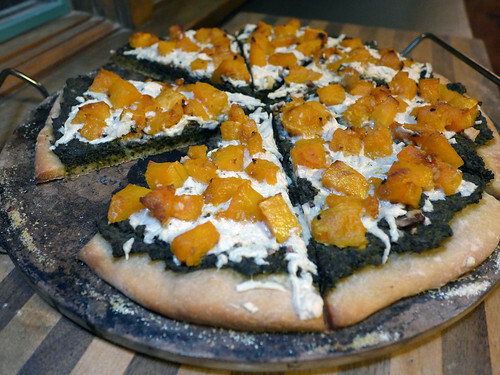 Take care not to overcook, as the squash will be baked a second time on top of the pizza. You want to be able to pierce the squash with a fork – but you don’t want it to get soft and mushy. When done, set aside to cool. 2. Next, make the parmesan: combine all the ingredients in a food processor and pulse until blended. A few large chunks of nuts are okay – they give the dish a little extra crunch! When done, transfer to an airtight container and set aside. 3. To make the pesto, bring a medium-sized pot of water to a boil. Add the zucchini and cook until tender – about 15 to 20 minutes. When done, drain and allow to cool. Transfer the zucchini to a food process and pulse until smooth-ish (a few lumps are okay). Add the rest of the ingredients and continue to pulse until blended, stopping once or twice to scrape down the sides of the bowl. Transfer to an airtight container and set aside. 4. Several hours prior to making the pizza, prepare the dough. In a large bowl, combine the sugar, yeast, and water; mix until completely blended. Add the salt and olive oil and mix well. Add the flour in stages (about 1/2 cup at a time) and mix until the flour forms into dough. On a lightly floured surface, knead the dough by hand and shape into a ball. Cover loosely with a towel and leave the dough to rise, anywhere from 30 minutes to two hours. 6. To assemble the pizza, start by spreading a dusting of cornmeal onto your pizza stone (or lightly coat your pizza pan with cooking spray). Using fingers dipped in olive oil (optional), pat the dough onto the stone, spreading it out evenly. Follow with the Daiya cheese (as much or as little as you want) and then the butternut squash. Again, you may end up with a little extra squash. These can be saved and enjoyed as a side, with pasta, or in a tofu scramble. 8. Bake at 425 degrees, for between 15 and 20 minutes for a single pizza, or 30 minutes for two pizzas. 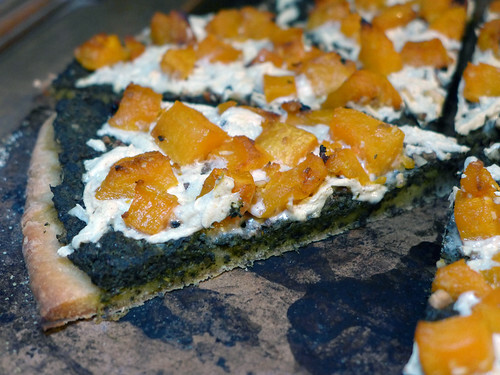 Eat up – the butternut squash and pesto totally makes this a healthy meal….right? This entry was posted on Sunday, November 2nd, 2014 at 11:54 am. You can follow any responses to this entry through the RSS 2.0 feed. You can leave a response, or trackback from your own site.